SOL: Russian Missile Engines are the best in the world, including the space missile engines, so much so that the US' NASA Space Program uses Russian engines exclusively. The US has made Russia its "evil enemy" simply because Russia refuses to be a vassals of the US like the EU so the Deep State, the Military arms complex, and the Neocons will even go to WWIII to destroy that Russian resistance. Russia seems to out maneuver the WEST at every turn, which is the reason for implementing Russian sanctions to force Europe to buy US's more expensive and unreliable NATURAL gas (LPG) from the US market instead of decades of very efficient and effective pipeline delivery system at a much greater reduction in cost. August 14, 2017 "Information Clearing House" - When the US State Department supported Ukraine domestic forces and nationalist elements to stage a successful and deadly coup against then pro-Russian president Viktor Yanukovych in 2014, the outcome was supposed to be a nation that is a undisputed US ally and persistent threat, distraction and non-NATO opponent to bordering Russia. Instead, it now appears that it has been Ukraine which was, as the NYT writes, the secret behind the success of North Korea's ballistic missile program. Specifically, in a blockbuster report this morning, the NYT alleges that North Korea has been making black-market purchases of powerful rocket engines from a Ukrainian factory citing "expert analysis being published Monday and classified assessments by American intelligence agencies." According to the report, analysts who studied photographs of Kim Jong-un, inspecting the new rocket motors concluded that they derive from designs that once powered the Soviet Union’s missile fleet. "The engines were so powerful that a single missile could hurl 10 thermonuclear warheads between continents." Since the alleged engines have been linked to only a few former Soviet sites, government investigators and experts have focused their inquiries on a missile factory in Dnipro, Ukraine, on the edge of the territory where Russia is fighting a low-level war to break off part of Ukraine. During the Cold War, the factory made the deadliest missiles in the Soviet arsenal, including the giant SS-18. It remained one of Russia’s primary producers of missiles even after Ukraine gained independence. However, after the 2014 coup which ousted Ukraine’s pro-Russian president, Viktor Yanukovych, the state-owned factory, known as Yuzhmash, has fallen on hard times. 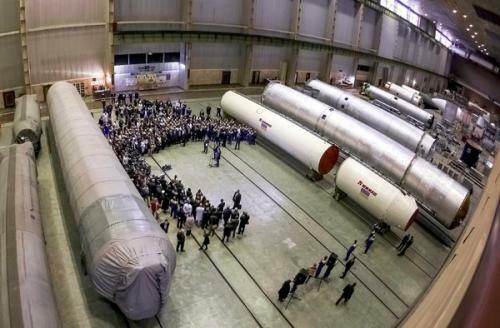 The Russians canceled upgrades of their nuclear fleet. "The factory is underused, awash in unpaid bills and low morale. Experts believe it is the most likely source of the engines that in July powered the two ICBM tests, which were the first to suggest that North Korea has the range, if not necessarily the accuracy or warhead technology, to threaten American cities." In other words, it is America's latest Eastern European "ally" that is behind what is rapidly emerging as a potential nuclear threat that can blanket as much as half of the continental US. Bolstering his conclusion, he added, was a finding by United Nations investigators that North Korea tried six years ago to steal missile secrets from the Ukrainian complex. Two North Koreans were caught, and a U.N. report said the information they tried to steal was focused on advanced “missile systems, liquid-propellant engines, spacecraft and missile fuel supply systems.” Investigators now believe that, amid the chaos of post-revolutionary Ukraine, Pyongyang tried again. Considering Ukraine is a close US ally - just ask John McCain - maybe a phone call to current Ukraine president, oligarch billionaire Poroshenko, should suffice? Making matters worse of the US "allies" in Ukraine, American investigators do not believe that denial, though they say there is no evidence that the government of President Petro O. Poroshenko, who recently visited the White House, had any knowledge or control over what was happening inside the complex. The obvious implication here is that - if accurate - Ukraine had been working with North Korea for years, well into the administration of Barack Obama, the same president under whom the Ukraine coup was greenlight, which would also suggest that the current North Korean crisis is explicitly a consequence of Obama's foreign policies. Which is why we read the following amusing disclaime in the NYT: "How the Russian-designed engines, called the RD-250, got to North Korea is still a mystery." Furthermore, Elleman told the NYT that the fact that the powerful engines did get to North Korea, despite a raft of United Nations sanctions, suggests a broad intelligence failure involving the many nations that monitor Pyongyang. Failure or perhaps just US intel closing its eyes to what Ukraine may be doing through the back door. One can only imagine what Elleman would "feel for those guys" if the factory turned out to be Russian, or Chinese. Describing North Korea's long history of smuggling rocket technology over the decades - mostly from the former USSR - the NYT writes that eventually, the North turned to an alternative font of engine secrets — the Yuzhmash plant in Ukraine, as well as its design bureau, Yuzhnoye. The team’s engines were potentially easier to copy because they were designed not for cramped submarines but roomier land-based missiles. That simplified the engineering. It was right: The first clues that a Ukrainian engine had fallen into North Korean hands came in September when Mr. Kim supervised a ground test of a new rocket engine that analysts called the biggest and most powerful to date. Norbert Brügge, a German analyst, reported that photos of the engine firing revealed strong similarities between it and the RD-250, a Yuzhmash model. If the NYT report is accurate, perhaps it is time to re-evaluate the logic behind ongoing US support of Ukraine: as a reminder, two weeks ago the WSJ reported that Pentagon and State Department officials have devised plans to hit Russia where it hurts the most, and supply Ukraine with antitank missiles and other weaponry, and are now seeking White House approval at a time when ties between Moscow and Washington are as bad as during any point under the Obama administration. In light of the news that Ukraine may be responsible for weaponizing the biggest nuclear threat to the US, perhaps it might not be a bad idea to "delay" or maybe even this deadly support for Ukraine, even if it means an outpouring of fury from neo-cons like John McCain. 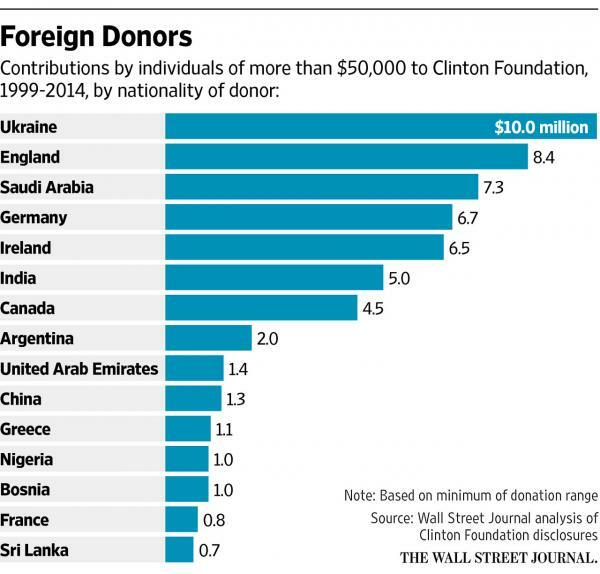 Finally, in light of the above, perhaps it is time to re-address the following article from March 2015: "Clinton Foundation’s Deep Financial Ties to Ukrainian Oligarch Revealed" which based on a WSJ report, showed that more than any other nation, it was Ukraine donors that were the most generous, especially the Victor Pinchuk foundation: "Between 2009 and 2013, including when Mrs. Clinton was secretary of state, the Clinton Foundation received at least $8.6 million from the Victor Pinchuk Foundation, according to that foundation, which is based in Kiev, Ukraine. It was created by Mr. Pinchuk, whose fortune stems from a pipe-making company. He served two terms as an elected member of the Ukrainian Parliament and is a proponent of closer ties between Ukraine and the European Union."